In Barron’s look-ahead piece, not one strategist sees the prospect for a market decline. This is called group-think. Out of 49 economists surveyed, 35 say the U.S. economy will outperform the already upwardly revised GDP forecasts while only 14 say we will underperform. This is capitulation of historical proportions. The weekly fund flow data from the ICI showed not only massive outflows, but in aggregate, retail investors withdrew a RECORD net $8.6 billion from bond funds during the week ended December 15 (on top of the $1.7 billion of outflows in the prior week). Maybe now all the bond bears will shut their traps over this “bond-bubble” nonsense. Investors Intelligence now shows the bull share heading up to 58.8% from 55.8% a week ago, and the bear share is up to 20.6% from 20.5%. So bullish sentiment has now reached a new high for the year and is now the highest since 2007 ― just ahead of the market slide. Over the course of 2010, numerous analysts were saying that people must own stocks because the dividend yields will be more than that of the 10-year Treasury, but alas, here we are today with the S&P 500 dividend yield at 2% and the 10-year T-note yield at 3.3%. 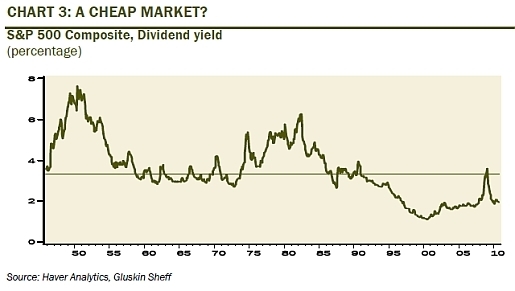 In essence, dividend yields are supposed to be higher than the risk free yield in a fairly valued market because the higher yield is “supposed to” compensate the investor for taking on extra risk. The equity market in gold terms has been plummeting for about a decade and will continue to do so… Back in 2000 it took over 40 oz of gold to buy the Dow; now it takes a little more than 8 oz. This is typical of secular bear markets and this ends when the Dow can be bought with less than 2 oz of gold. Even then, an undershoot could very well take the ratio to 1:1. The number of stocks in the S&P 500 that are making 52-week highs is declining even though the index continues to make new 52-week highs. For December, the Shiller P/E ratio says stocks are now trading at a whopping 22.7 times earnings! In normal economic periods, the Shiller P/E is between 14 and 16 times earnings. Coming out of the bursting of a credit bubble, the P/E ratio historically is 12. Coming out of a credit bubble of the magnitude we just had, the P/E should be at single digits. The unsold existing inventory is still 80% above the historical norm, at 3.7 million and that does not include the ‘shadow’ foreclosed inventory.. Completing the mean-reversion process would entail a further 23% decline in real home prices from here. In a near zero percent inflation environment, that is one massive decline in nominal terms. Prices may not hit their ultimate bottom until some point in 2015. Arguably the most understated issue facing both U.S. economy and U.S. markets is the escalating fiscal strains at the state and local government levels, particularly those jurisdictions with uncomfortably high pension liabilities. In the absence of Chapter 9 declarations or dramatic federal aid, fixing the fiscal problems at lower levels of government is very likely going to require some radical restraint, perhaps even breaking up existing contracts for current retirees and tapping tax payers for additional revenues. Next Goldrunner: Gold and the PM Stocks Will Make 2011 A Happy New Year For All!